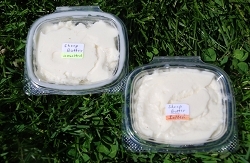 Goat butter is made by chilling the goat cream once, separating the liquid (buttermilk) from the solid (butter), then chilling the solid butter to 60 degrees to keep it firm. This has to be the best butter I've ever had. Really light and mild. Had she been able to taste it, I can imagine the utterly satisfied look on Julia Child's face.